We have the experience and capabilities to handle your HAZMAT products. 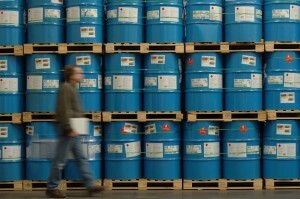 Evans Distribution Systems has expertise in the warehousing and distribution of hazardous and non-hazardous chemicals. Over the years Evans has developed a unique specialization in design and management for chemical warehousing facilities. Our staff is specially trained in the handling of hazardous materials from the arrival at our warehouse to the transportation of the product to its final destination. Evans can also provide a complete integrated solution that includes transportation management services for hazardous materials and HAZMAT products. We would be happy to work with you to develop a customized solution if your chemical warehouse requirements are of a larger scale. Please contact us for more information.